Donate to Play for P.I.N.K. Want to show your support for your favorite team? Click here to go to the Play for P.I.N.K. donation page. 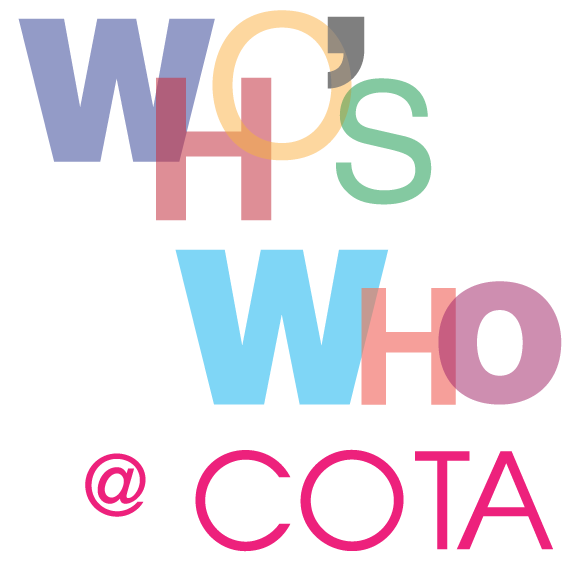 When you see the area where you fill in the event you would like to support, type in “COTA 2019: (your favorite team).” Team choices include Team Gardy Bloemers, Team Hylofit, Team MatchNRide, Team Purina or Team Winged Foot. You can choose any amount you’d like and we’ll report the outcome. It’s that simple! We did it! All of us . . .we did it again! And it was bigger, better and even more spectacular than ever. 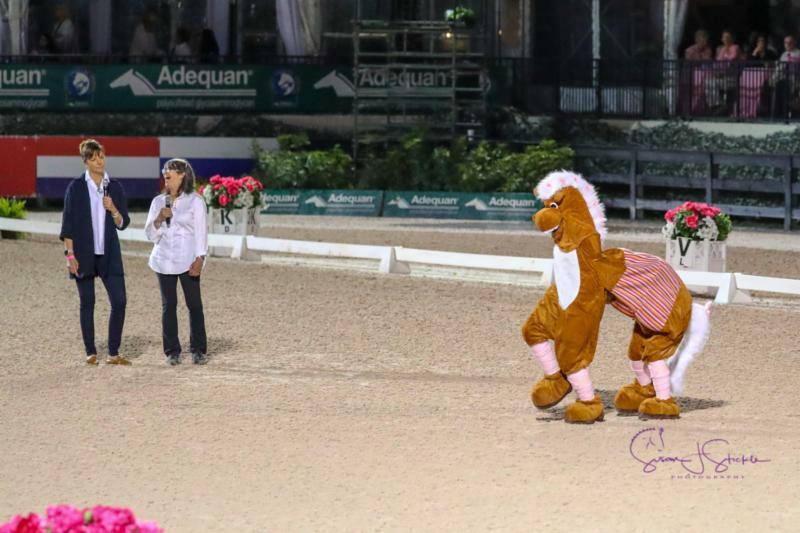 The quadrille teams stepped up their performances (if that’s even possible) and put on a show that thrilled the 500 VIP guests and the sold-out General Admission grandstands packed to capacity with an enthusiastic, and constantly clapping, crowd. If you weren’t able to attend in person, we hope you caught the amazing live stream provided by Chronicle TV. If not, it’s still available online. The Spectator Judging App, sponsored by IDA Development, was a great success with spectators and fans from around the world voting for their favorite teams. During the pre-event exhibitions, we enjoyed the upbeat music and jumping quadrille performed beautifully by the first family of jumping, Millar Brooke Farm, with riders Charlotte McLaughlin, Amy Millar, Jonathon Millar and Kelly Soleau-Millar. And we laughed at the delightful skit by Shining Moments, performed by Jordan Osborne and Londyn Pachota, participants in Lendon Gray’s Winter Intensive Training program. That pony really had all the moves and Tigger Montague and Pati Pierucci were hilarious commentators! Thank you to the Challenge team sponsors: Gardy Bloemers/Merrill Lynch Wealth Management, Hylofit, MatchNRide, Purina, and Winged Foot Enterprises. As team sponsors, you make it possible for us to continue our fight against breast cancer. 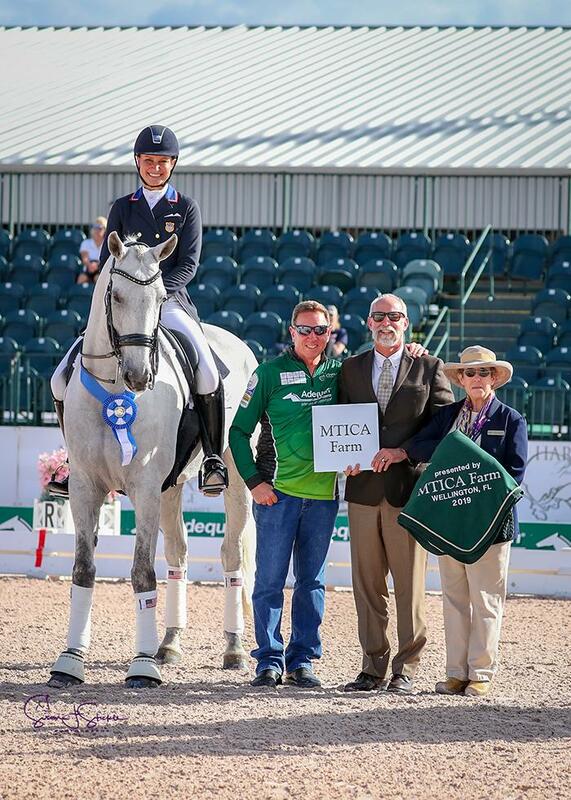 Thanks to Cunningham & Cunningham Livestock Insurance for protecting the COTA benefit with the best insurance coverage possible and, to our media partner, the United States Dressage Federation, for partnering with us to for helping us spread the word and challenge breast cancer. BioStarUS and its owner, Tigger Montague, went above and beyond to make the evening a rousing success and Back On Track came through again as a valued supporter. We are so grateful to the Pink Patrons: Florida Atlantic University Schmidt College of Medicine, IDA Farm, Lark’s Home Run and Oak Meadows Farm. Thank you Partners for P.I.N.K. AmFund, EquiJet, Summit Performance, Susan J. Stickle Photography, The Horse Of Course, The Tackeria and Van Dell Jewelers. The COTA Committee was in overdrive for months before the event to ensure a fabulous evening. Thank you Paula Beauchesne, Sophie Ghedin, Eileen Johnston, Terri Kane, Ilona Klimek, Randy Leoni, Mary Ross, Alex Rozboril, Elizabeth Stauber-Johnson, Cathy Tarantini, Sue Weakley, Barbara Wolff, Kim York and Lily Zilo. And we must not forget the volunteers, a special group of individuals who provided invaluable assistance by keeping on-site operations running smoothly throughout the evening’s festivities. There are so many unsung heroes who donated their time and money to this event and we can never thank you enough for your support. And how about those riders? 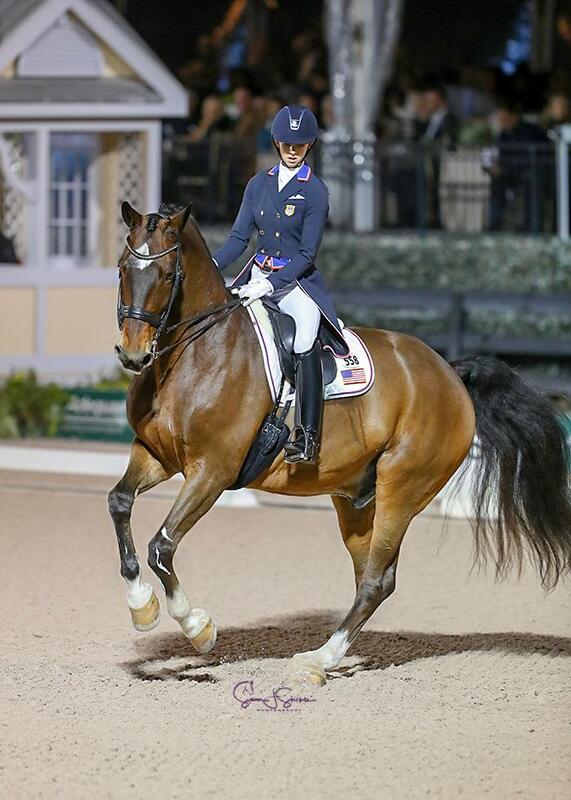 These accomplished athletes and their talented horses gave their all. For two months, each team of riders met every week without fail to practice their routines. Together with the talented choreographers and coaches, they developed, planned and perfected their fabulous performances and made March 8 an evening to remember. 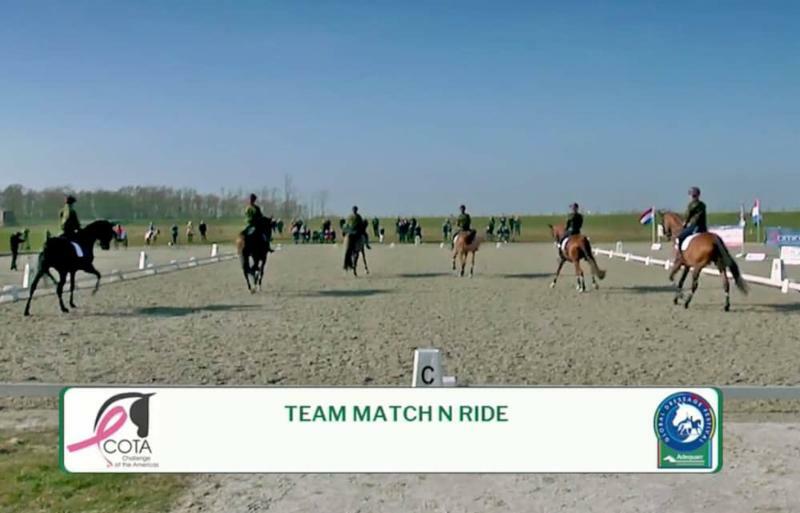 Holland-based Team MatchNRide performed via jumbotron for us with their military- themed quadrille choreographed by Marieke Verdonk. The team even traveled from Holland to Wellington again this year to join in the evening’s festivities. We can’t wait to see what they come up with next year! When Team Hylofit came in to the arena, the entire audience thought they were riding Clydesdales and there were whispers from the crowd that they had never seen draft horses move like that. The costume details were half-time worthy. Now we all want a dressage draft horse! Thank you for bringing in fresh ideas and thanks to choreographer and rider Melissa MacLaren Velix, riders Meagan Davis, Heidi Degele, Nicholas Hansen, Molly Paris, Caleb Scroggins and Hylofit’s Secret Weapon, Jacquie Brooks. Team Purina – you took us back in time with the best music of the 70s. The audience was singing and clapping along with the team’s precise performance. Thanks for providing the moon glow as Jupiter aligned with Mars at the Global Dressage Festival Stadium. We loved the peace sign halt and salute! Thank you, too, choreographer and coach Terry Ciotti Gallo along with coach Bill Warren and riders Pamela Goodrich, Bent Jensen, Olivia LaGoy-Weltz, Kasey Perry-Glass, Betsy Steiner and George Williams. 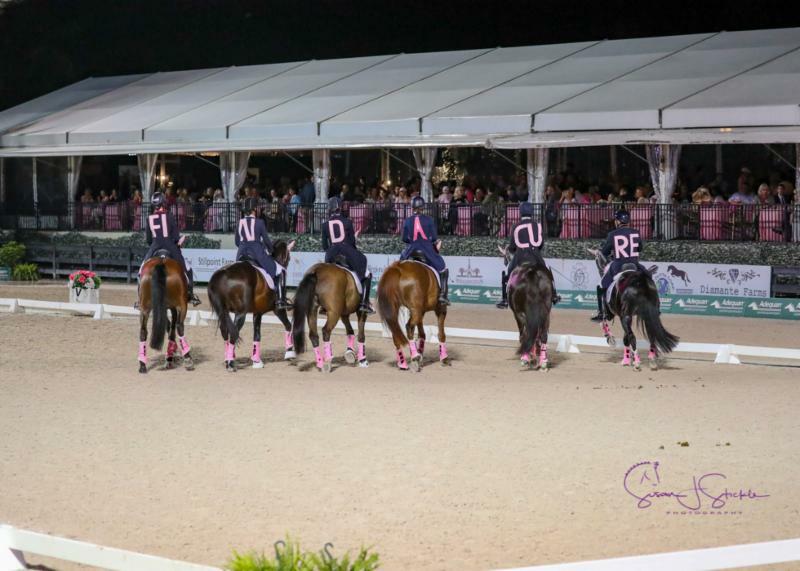 Once again, Team Winged Foot wowed us with their signature rider jacket designs that punctuated their elegant attire and, this year, they spelled out “FIND A CURE.” The audience loved figuring it out as they wove though their intricate choreography set to the rousing (and singable!) music of Queen. Thank you choreographer and coach Ruth Hogan-Poulsen and coach Susanne Hamilton along with riders Marco Bernal, Raúl Corchuelo, Shannon Dueck, Bridget Hay, Yvonne Losos de Muñiz and Ilse Schwarz. The last team to go, Team Gardy Bloemers, Merrill Lynch Wealth Management, blew the audience away with their daring and creative choreography by Tigger Montague and music from “Pirates of the Caribbean.” Decked out in full costume, Jack Sparrow (aka James Koford), along with pirates and wenches Lauren Chumley, Rebecca Cowden, Allison Kavey, Betsy Van Dyke and Noel Williams performed thread-the-needle canter half-pass sequences that were thrilling and brought the audience to their feet. 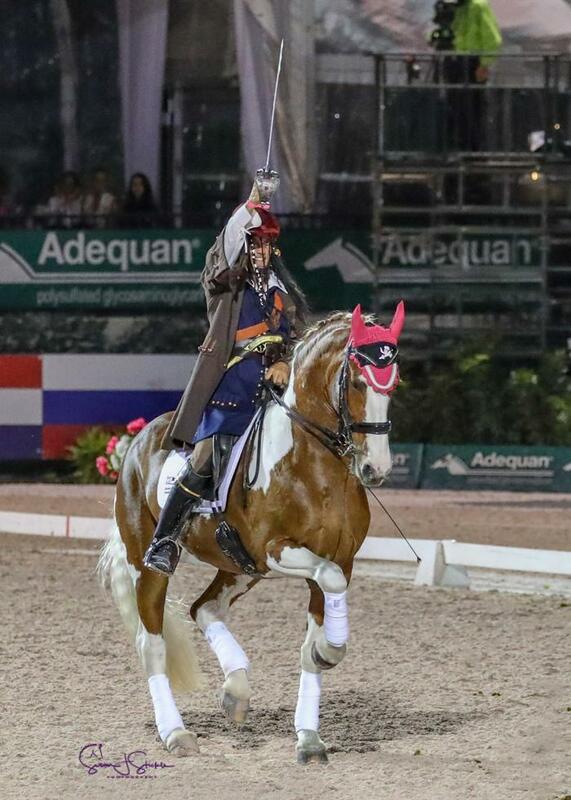 Congratulations Team Gardy Bloemers, Merrill Lynch Wealth Management for winning the 2019 Challenge of the Americas quadrille competition! As we bask in the afterglow of the 2019 Challenge of the Americas, the teams are already discussing their strategies and we are planning to continue the fight to #challengebreastcancer and help find a for a cure for breast cancer in 2020. We can’t wait to see you there! This entry was posted in News and Announcements, South Florida News on March 13, 2019 by ludlumfarms. 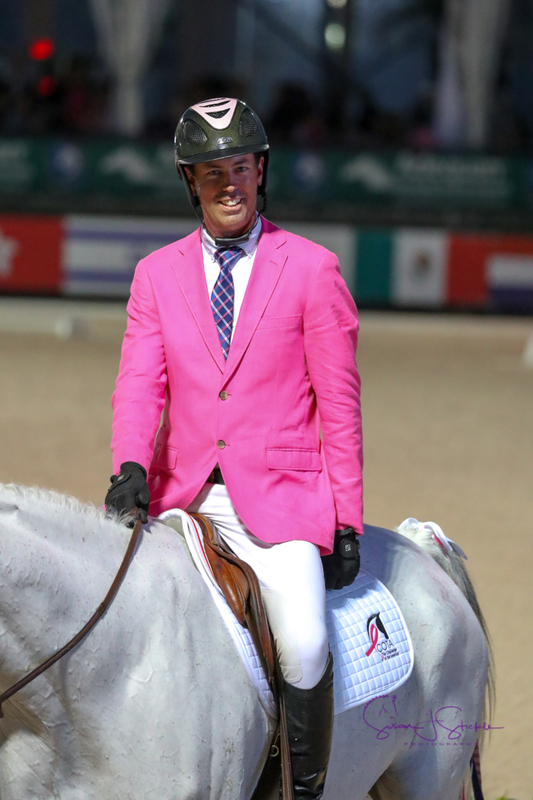 Wellington, FL (February 18, 2019) – Gold Medal Olympian, Carl Hester, says his secret to winning is all about keeping his horses happy. This is why he has been named as a Premier Equestrian during Week 5 of the Adequan Global Dressage Festival CDI (AGDF). “I find it totally normal to keep horses in a way that they’re happy,” says Hester, “They’re turned out a lot, we hack a lot, and we only school four days a week at home.” He adds, “We’re seeing this more and more with Dressage horses having a chance to have a break and stretch their legs and go out to roll and have fun.” Hester continues, “It’s a sport and it’s tough and they go through a lot of training, so it’s lovely to know that they have some down time as well. A horse, of course, wants to be a horse!” he smiles. Hester was raised in the UK on the tiny Channel island of Sark. The island has no cars, and so horses are very much part of lifestyle. At 19 Hester had no ambition or aspirations, but with no jobs on Sark and winter coming, he decided to apply for a job with horses on the mainland. Through an advertisement in Horse and Hound, he arrived at the Fortune Centre in Hampshire, where adults with learning and physical disabilities are given a sense of freedom and achievement through riding. It was there Hester had his first opportunity to compete and it was on the Fortune Centre’s skewbald mare, Jolly Dolly, that Hester won the 1985 Young Dressage Rider Championship. This part of Hester’s career is well documented but it is sufficient to say that he feels a lasting fondness and debt to Dr and Mrs B who literally gave him the chance of a lifetime.” I rode and trained with Dr B for three and a half years and in 1990 went to the World Championships on Rubelit von Unkenriff, the European Championships in 1991 and in 1992 the Barcelona Olympics on Georgioni. I was the youngest British rider to ever compete in an Olympic Games. It was the most amazing thing that had ever happened to me, and a period that changed the course of my life.” From there, Hester went on to win the gold medal in the 2012 London Olympics and a silver medal from the 2016 Olympics in Rio de Janeiro, and he continues to be a shining star on the Great Britain Team. Premier Equestrian wishes for all disciplines of equestrians and horse lovers to have enjoyable experiences with their horses, in or outside the show ring. The company is proud to offer an affordable choice for first-rate American-made products that enhance the equestrian performance of its customers. For more information about Premier Equestrian and its full line of products including footing, dressage arenas, and arena groomers, please call 1-800-611-6109 or visit www.PremierEquestrian.com. This entry was posted in News and Announcements, South Florida News on February 19, 2019 by ludlumfarms. 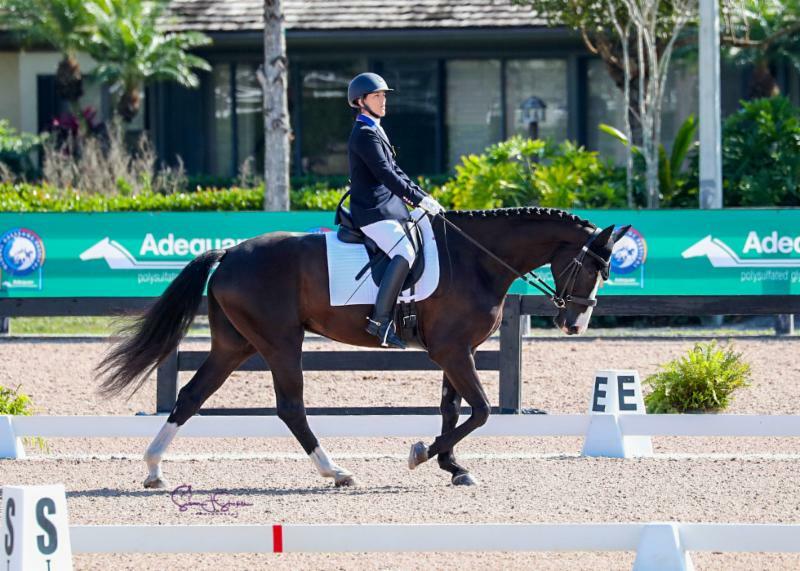 Wellington, FL – February 16, 2019 – The sixth week of the Adequan® Global Dressage Festival (AGDF) featured National competition with a riders and horses in a variety of divisions on February 15-16. 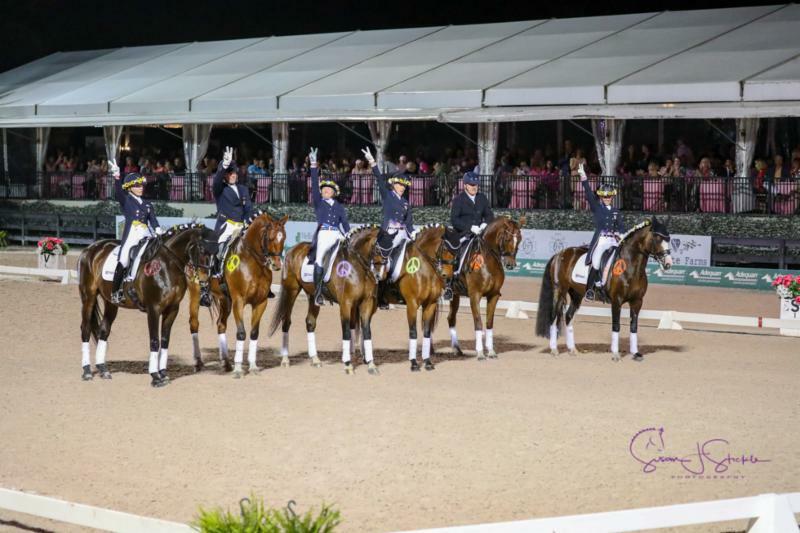 CDI Competition will resume for Week 7 on February 21 and will feature the “Friday Night Stars” FEI Grand Prix Freestyle CDI-W, presented by Helgstrand Dressage on Friday, February 22. 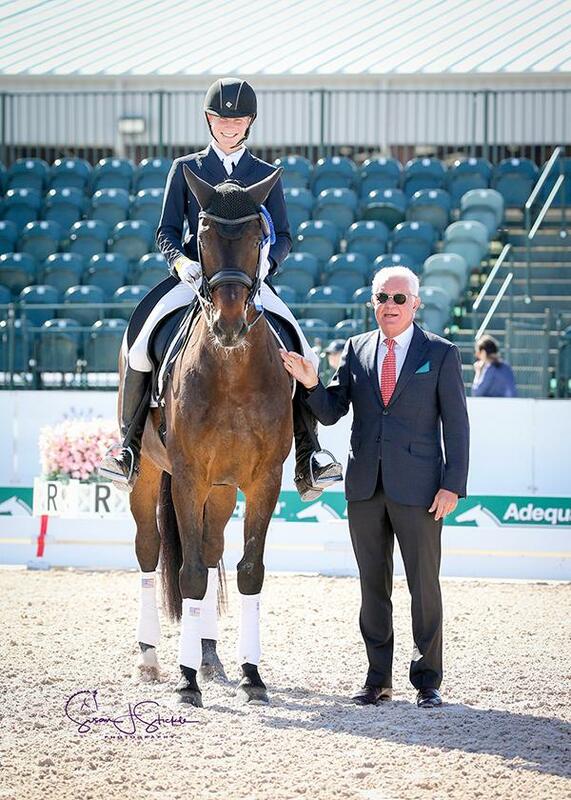 Katie Johnson (USA) and Paxton won the USEF Developing Prix St. Georges, presented by Vita Flex, with a score of 69.438%. The pair are now the first from the United States qualified for the Iron Spring Farm Future Stars Performance Series Final in Week 12 of AGDF. “I was very happy with my ride. 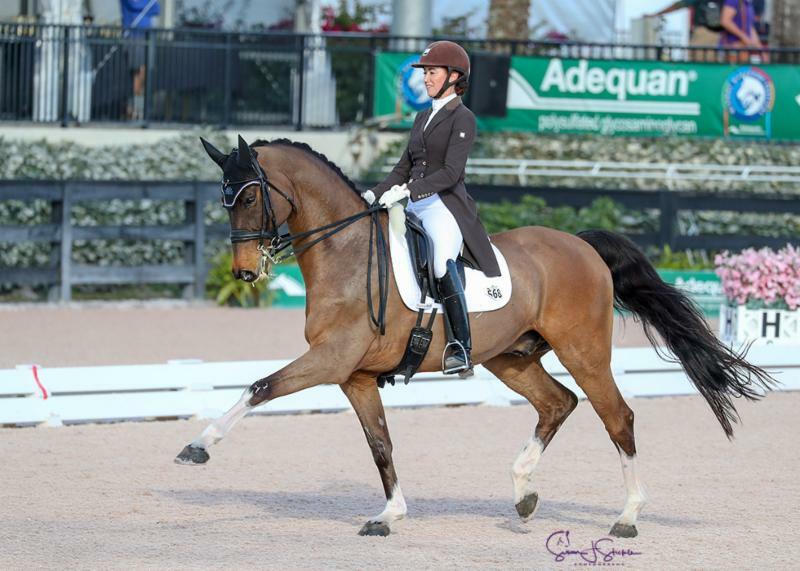 He’s still really green at the Prix St. Georges level,” said Johnson about her partner, a 2011 Westphalian gelding by Dante Weltino owned by Kylee Lourie. 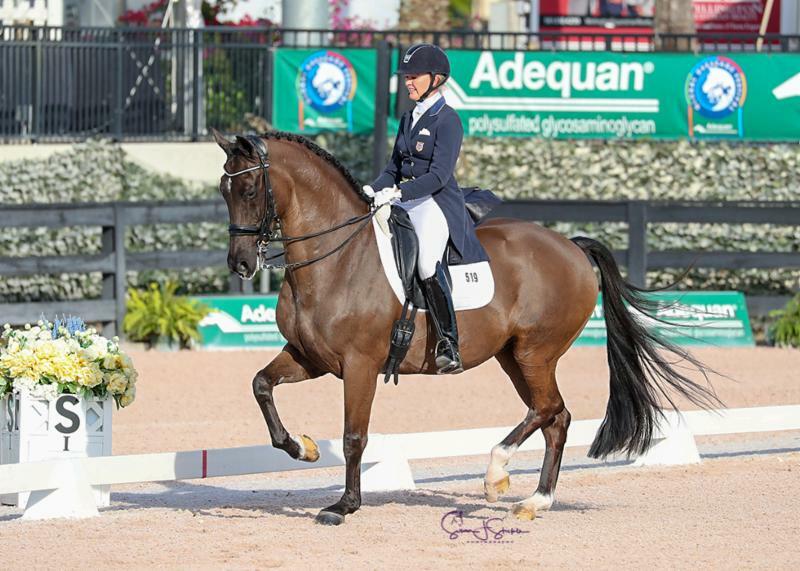 Melissa Vaughn (USA) and Belrano Gold, a 2011 Oldenburg gelding by Bellissimo M owned by Pferdes LLC, started off the morning on Saturday with a win in the Open section of the Fourth Level, Test 1. The pair earned a score of 70.513%. Linda Graves and De Ja Vu 2, her 2005 Oldenburg gelding by Dimaggio, won the Adult Amateur section with a score of 65.128%. 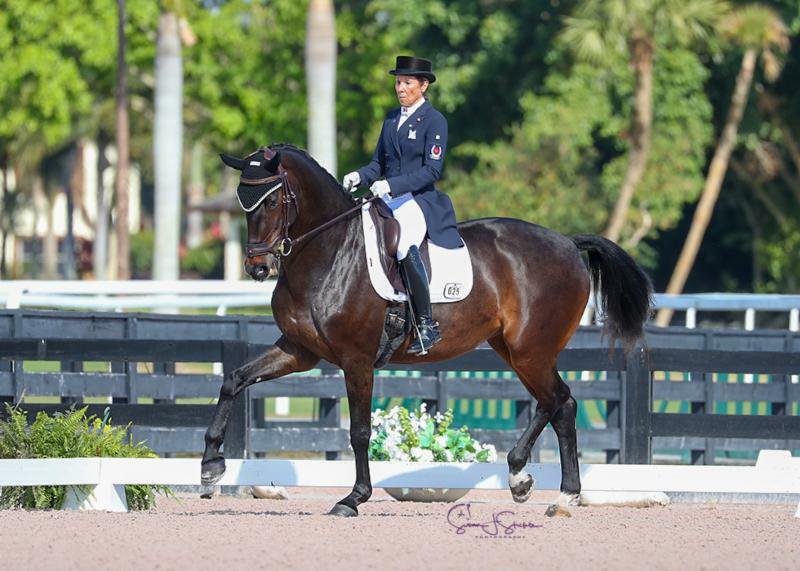 Roxanne Trunnell (USA) and Dolton, a 2012 Hanoverian gelding by Danone I, rode a strong Para I Test, and won the Para Equestrian Test of Choice class with a score of 72.143%. 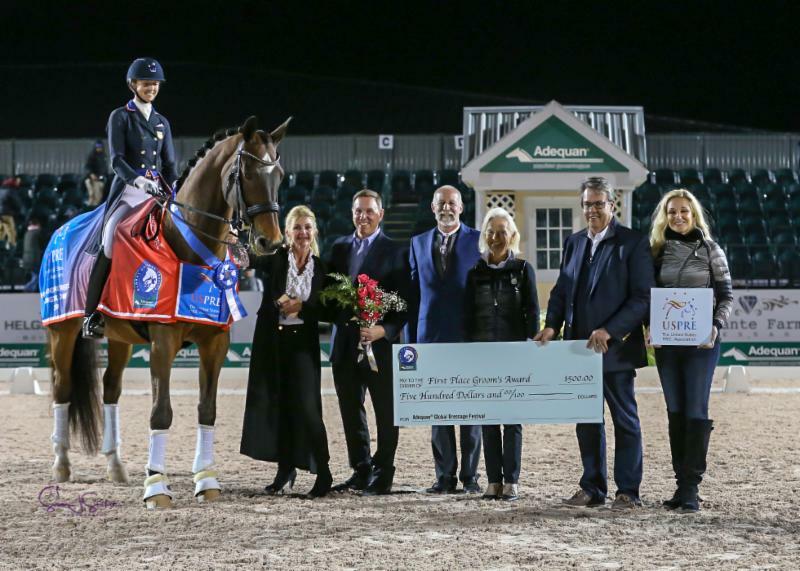 Christilot Boylen (CAN) and Rocky Lane, a 2006 Westphalian gelding by Rock Forever owned by Rebecca Stromatt, concluded the day with a win in the Open FEI Grand Prix*, presented by Wellington Equestrian Realty. The pair earned a score of 66.739%. Carrie Schopf (ARM) and Saumur won the Adult Amateur section, presented by Harmony Sport Horses, with a score of 65.128%. 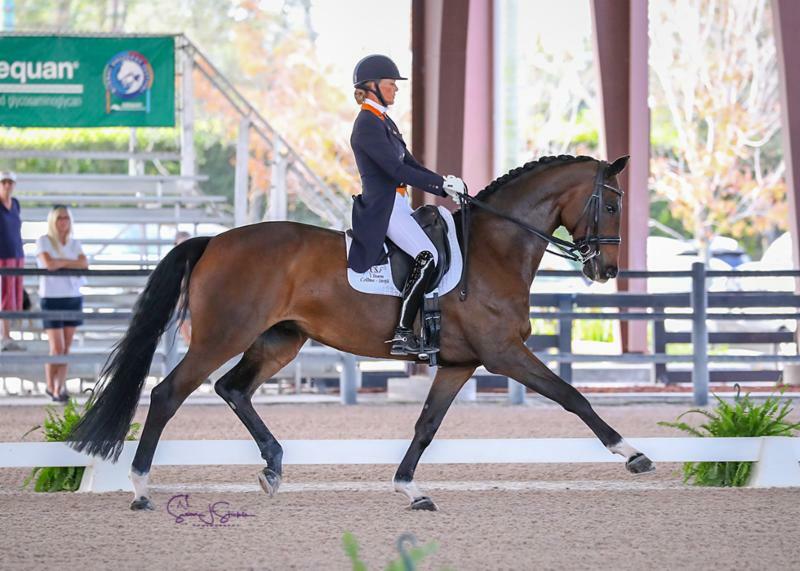 International competition at AGDF will resume for Week 7 from February 20-24, and features CDI-W and CDI 3* dressage competition. 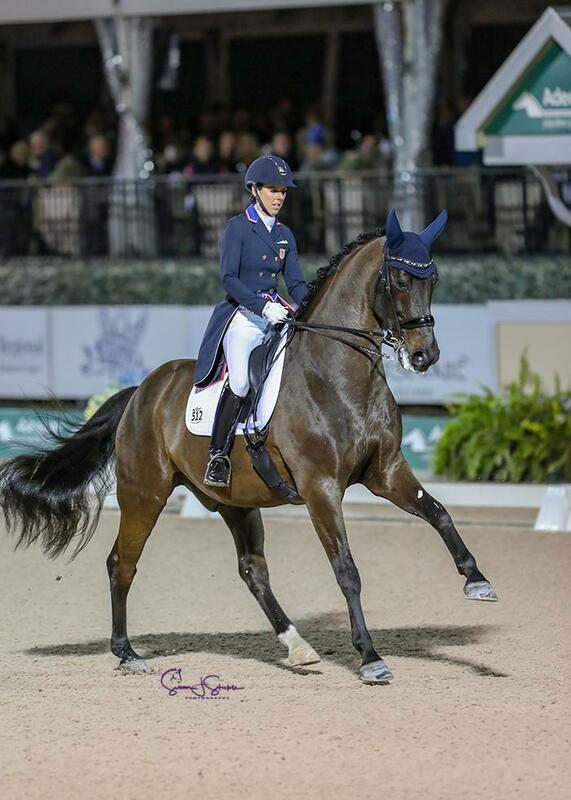 Helgstand Dressage will present the “Friday Night Stars” FEI Grand Prix Freestyle CDI-W on Friday, February 22. For more information, please visit www.globaldressagefestival.com. This entry was posted in News and Announcements, South Florida News on February 17, 2019 by ludlumfarms. 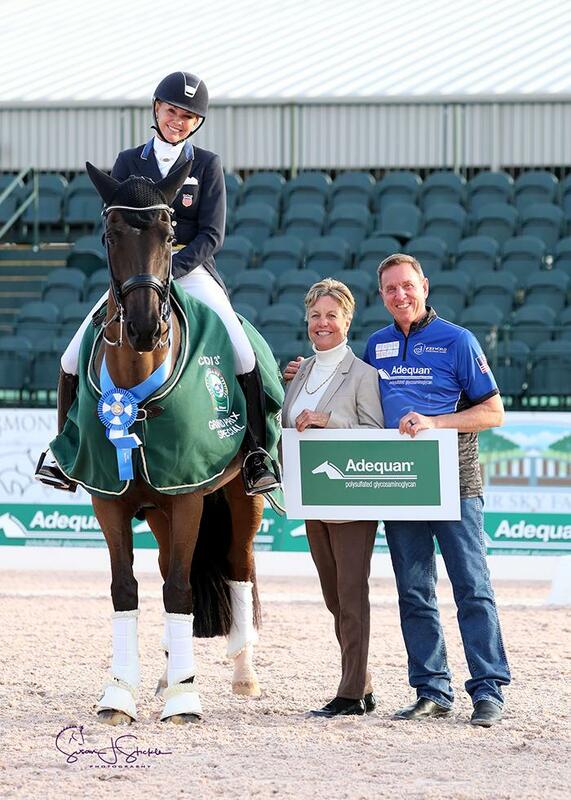 Wellington, FL – February 10, 2019 – Week 5 of the Adequan® Global Dressage Festival (AGDF) concluded on Sunday, February 10, with a win for Ashley Holzer (USA) and Valentine in the FEI Intermediate I Freestyle CDI3*, presented by Fair Sky Farm. AGDF continues on February 15-17 with national competition and on February 20-24 with AGDF 7 CDI-W competition. Earlier in the day in the FEI Young Rider Freestyle CDIY NAYC/USEF Qualifier, Benjamin Ebeling (USA) and Illuster Van De Kampert, a 11-year-old Belgian Warmblood gelding by Spielberg owned by Nuvolari Holdings LLC, won with a score of 72.825%. 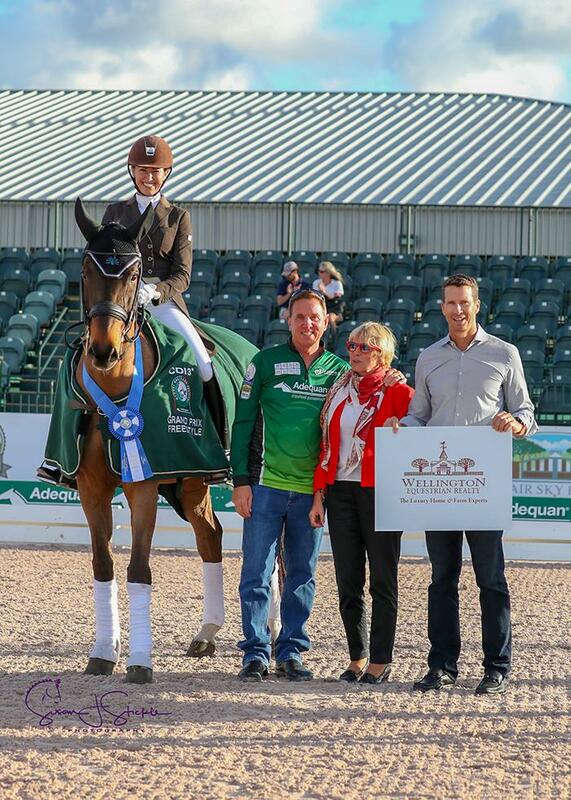 Second place went to Caroline Nicholson (USA) and Diozar, her 11-year-old KWPN gelding by Jazz. The pair earned a score of 70.925%. 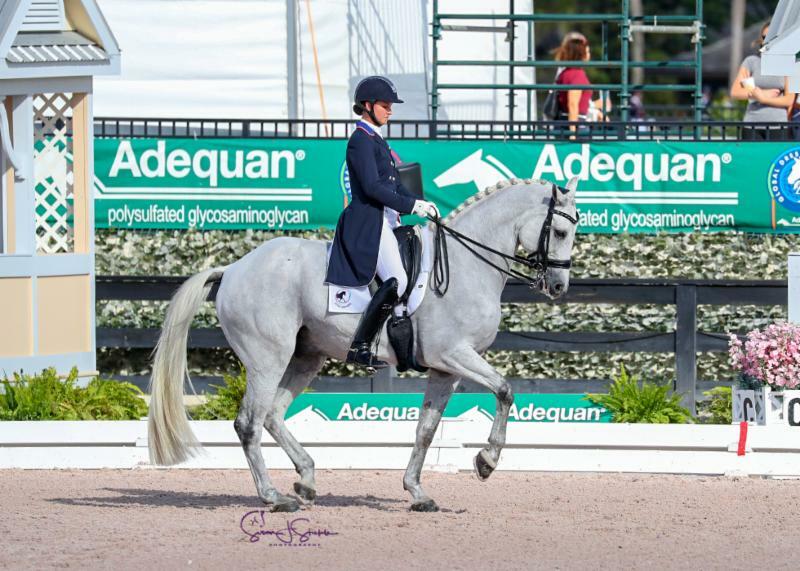 Vanessa Creech-Terauds and Fleur de Lis L, a 10-year-old Hanoverian, by First Dance and Louise Leatherdale, earned a score of 70.400% to come in third place. 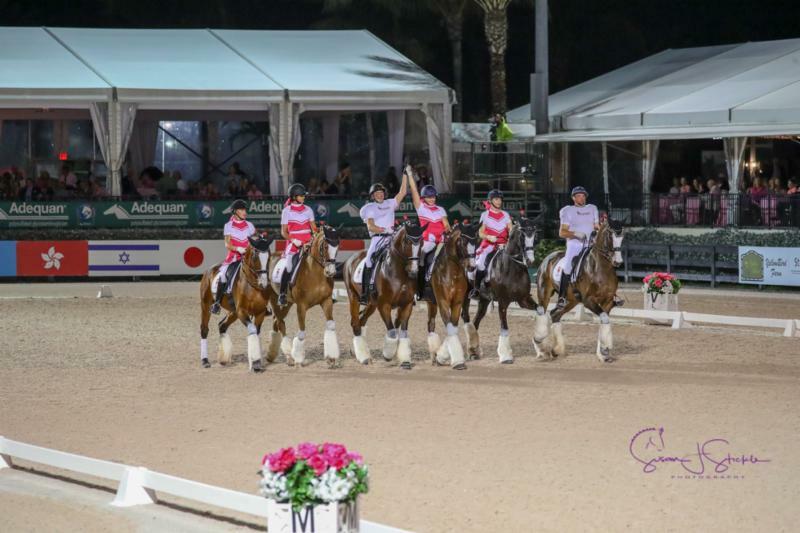 International competition at AGDF will resume for Week 7 from February 20-24, and features CDI-W and CDI 3* dressage competition. 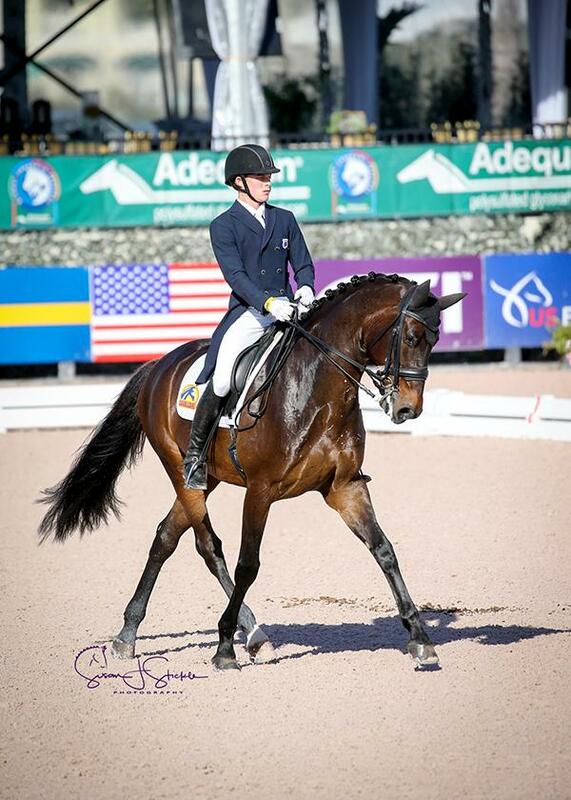 Helgstand Dressage will present the “Friday Night Stars” Grand Prix Freestyle CDI-W on Friday, February 22. For more information and to see a full list of results, please visit www.globaldressagefestival.com. This entry was posted in News and Announcements, South Florida News on February 11, 2019 by ludlumfarms. Wellington, FL (February 4, 2019) — After recently mastering 3rd Level Test 3 in Region 9, Tiago Ernesto, the head trainer of Haras Dos Cavalieros, now has his sights set on a successful season in Florida competing in Prix St Georges with the gorgeous Lusitano stallion, Hobbit Interagro. 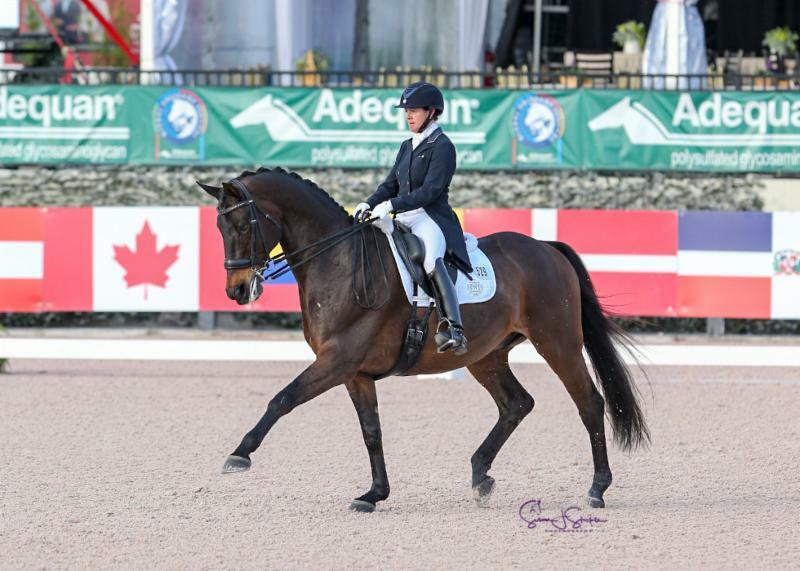 The jaw-dropping 7 year old stallion was the picture of health during Week Three of the 2019 Adequan Global Dressage Festival (AGDF), and his display of equine fitness and athleticism resulted in Ernesto being honored by winning the Omega Alpha Healthy Horse Award. Omega Alpha feels it is important to honor riders and trainers, like Ernesto, who make great health a top priority for their horses. Ernesto describes his role at Haras Dos Cavalieros, located in Houston, TX as having a strong focus on keeping all of their horses healthy and happy on the inside and out. The farm is one of the biggest breeders of Lusitano horses in the nation. With 30 mares that they breed every year to stallions that they own, and also to stallions in Portugal through AI, Haras Dos Cavalieros must make a priority of maintaining optimal health in all their horses to ensure the best Lusitano foals are brought into the US market. “Our goal is to introduce more Lusitanos into the marketplace,” Ernesto explains, “and also to take the Lusitanos as far as we can in competition.” In addition to the focus on dressage, Ernesto also trains and competes his horses in working equitation. He describes this discipline as being very mentally stimulating for both horse and rider, which helps the horses formulate a good attitude and a great work ethic. Working equitation involves skills such as going through an obstacle course without being affected by the many distractions that are a part of the test. The Lusitano breed is exceptional in this arena because of their historic roots and genetics producing the horses of today with very courageous hearts and minds. Ernesto is excited to be able to demonstrate this courage with his horses in the dressage ring throughout the season in Wellington. Haras Dos Cavaleiros has brought 10 horses from their ranch in Texas that they are showing in Florida for the duration of the circuit. Omega Alpha shares these same feelings about being proud of the horses’ well being and, in turn, horses’ performance. Therefore, it is important to them to honor owners and trainers, like Ernesto, who make great health a top priority for their horses. The Healthy Horse Award includes an assortment of popular Omega Alpha health products, a cooler, and a commemorative ribbon. Ernesto is excited to use Omega Alpha products. With all natural ingredients like marshmallow root, slippery elm, licorice root, and ginger root, the assortment of Omega Alpha products will help the horses of Haras Dos Cavaleiros maintain a level of optimum health so they can perform their best this season. 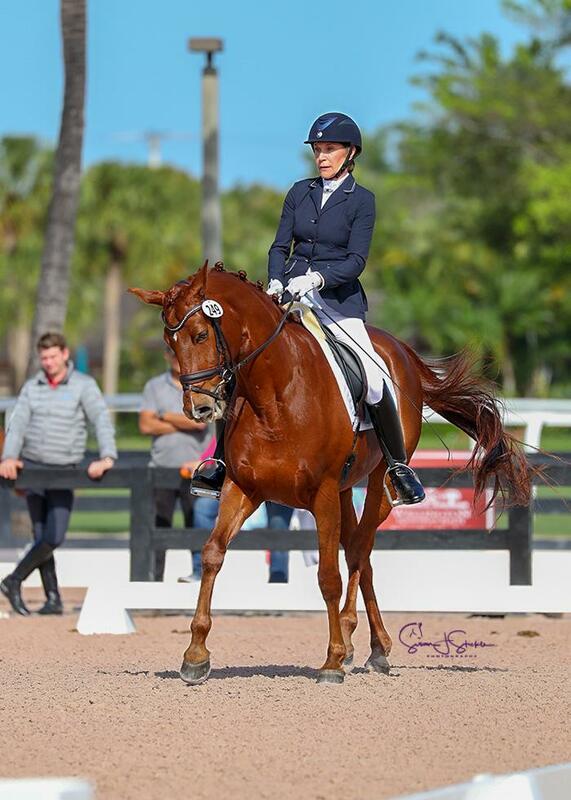 This entry was posted in FEI & USEF Dressage News, South Florida News on February 5, 2019 by ludlumfarms. 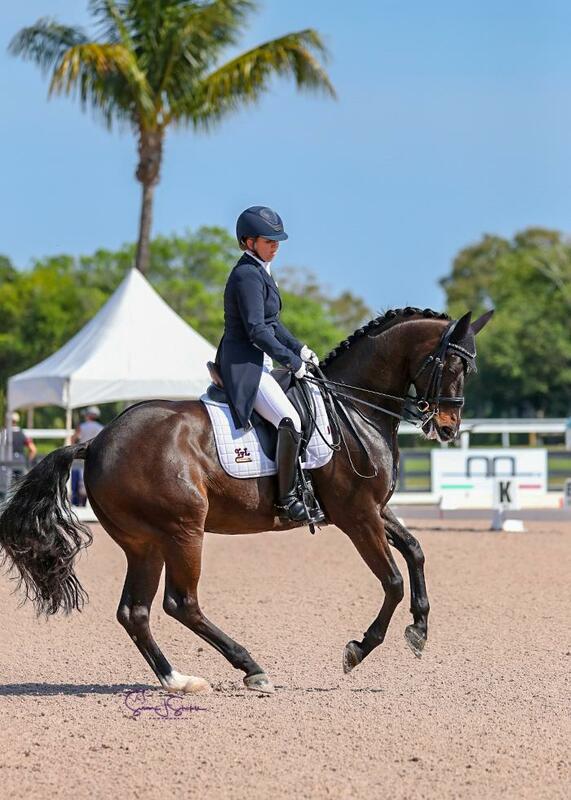 Wellington, FL – January 25, 2019 – U.S. dressage stars and currently ranked number two in the world, Laura Graves (USA) and Verdades performed a beautiful test and earned a score of 84.935% to win the FEI Grand Prix Freestyle CDI-W, presented by the U.S. P.R.E. 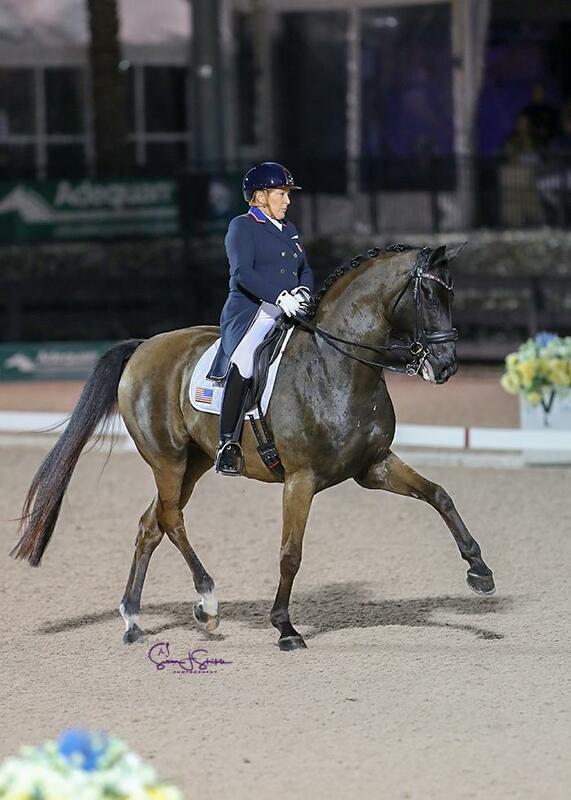 Association on Friday, January 25, at the Adequan® Global Dressage Festival (AGDF) in Wellington, FL. Week three of AGDF will conclude on Sunday, January 27, and AGDF continues through March 31. 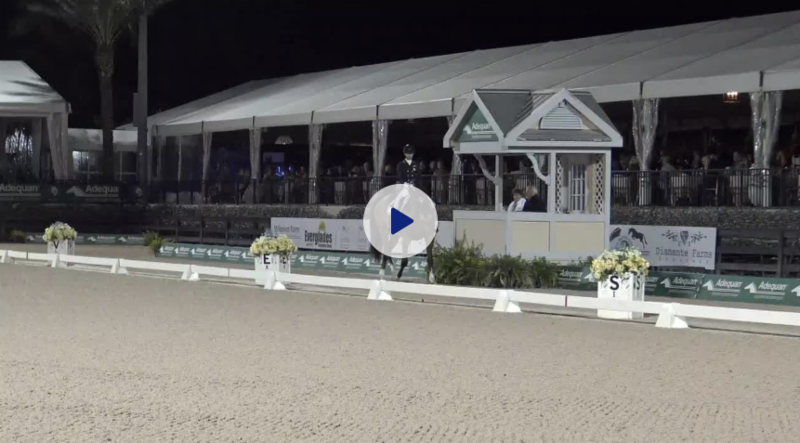 Watch the winning freestyle ride for Laura Graves and Verdades! Courtesy of Richard’s Equine Video. Watch the freestyle test for Kasey Perry-Glass and Goerklintgaards Dublet! Courtesy of Richard’s Equine Video. “It’s been a really exciting week for us,” said Jane Bistline of the U.S. P.R.E. Association. “We had the U.S. P.R.E. event on Wednesday night, where everyone brought their Spanish horses and we really had a nice time. “We’re just really honored to have you here in America,” she said to the top three riders. 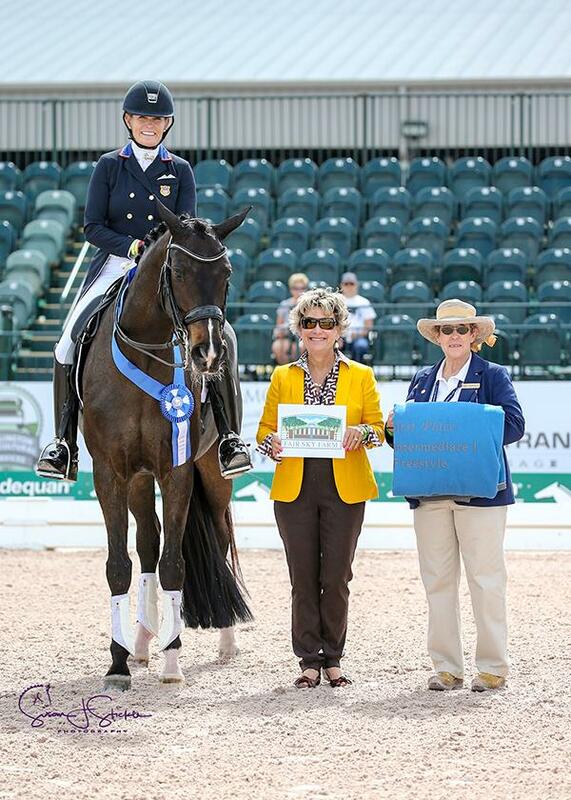 Earlier on Friday, Jennifer Baumert (USA) and Handsome, a 14-year-old Hanoverian gelding by Hochadel owned by Betsy Juliano LLC, won the FEI Intermediate I CDI3* presented by Horseware Ireland. The pair earned a score of 73.676%. 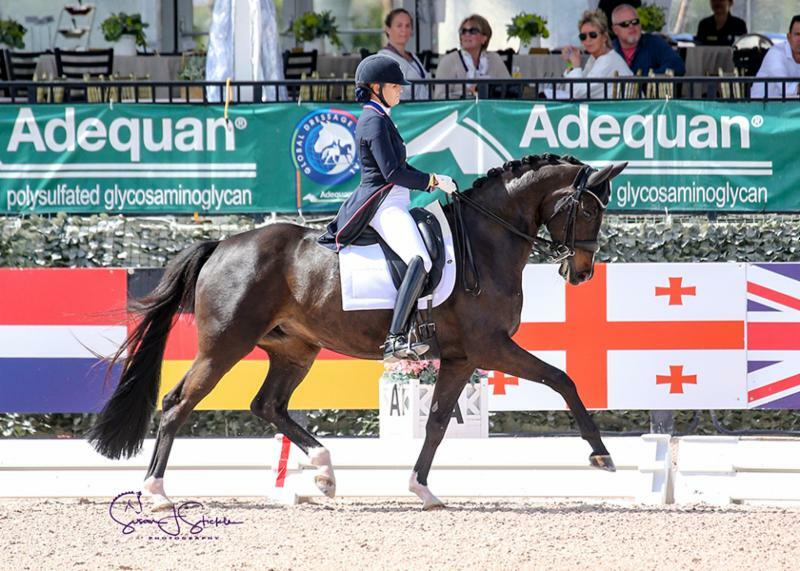 In the FEI Grand Prix Special CDI3*, presented by Adequan®, Katherine Bateson Chandler (USA) and Alcazar, a 14-year-old KWPN gelding by Cantango owned by Jane Forbes Clark, won with a score of 72.319%. Competition at AGDF will resume on Saturday, January 26, with a full schedule of classes, including the FEI Intermediate I Freestyle CDI3*, presented by Horseware Ireland. Competition will continue during Week 5 from February 6-10 at the Palm Beach International Equestrian Center (PBIEC) in Wellington, FL. 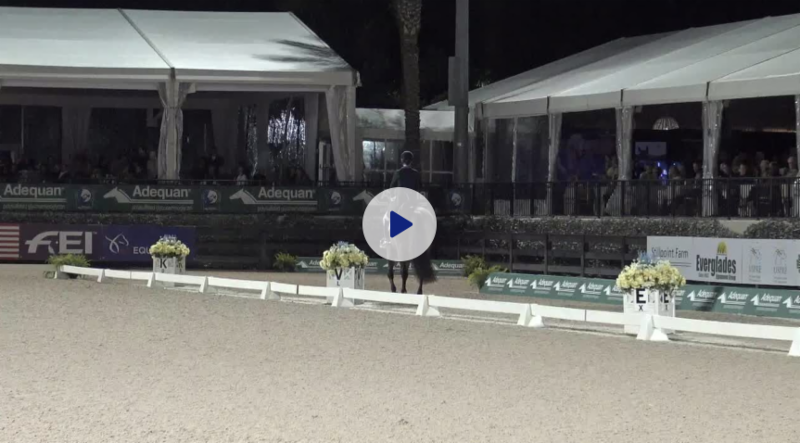 Week 5 features the Grand Prix Freestyle CDI 5*, presented by CaptiveOne Advisors, and the Grand Prix Special CDI 5*, presented by Wellington Equestrian Realty. 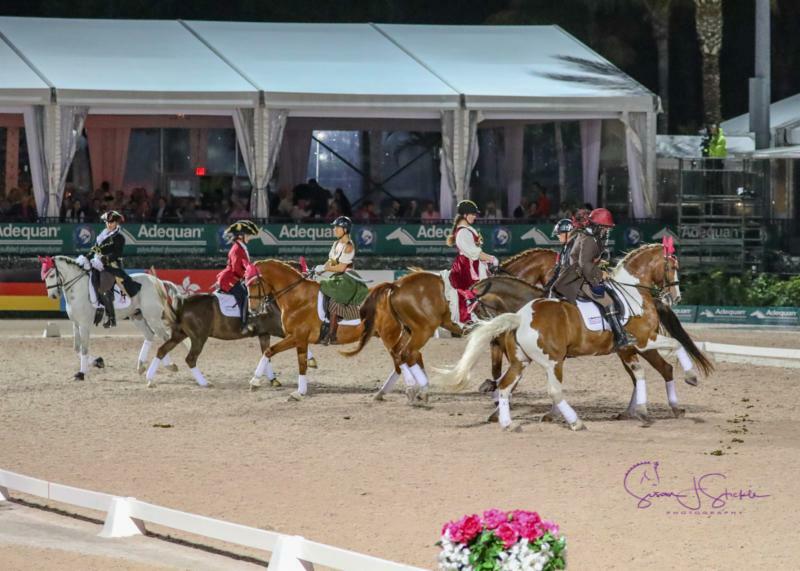 The 2019 AGDF hosts 7 CDI weeks, 2 CPEDI weeks, and national competition through March 31. For more information and to see a full list of results, please visit www.globaldressagefestival.com. This entry was posted in News and Announcements, South Florida News on January 26, 2019 by ludlumfarms.